An artistic design defect on the arrangement of the colours of the National Flag on the Voter Identification Card caused a stir at some polling centres in Accra on Thursday. However, the Electoral Commission (EC) explained that the defect would have no effect on the validity of the ID Cards. 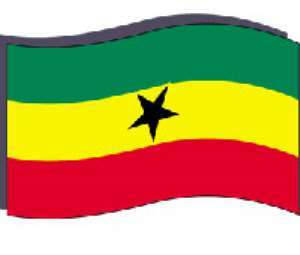 The Red, Yellow and Green colours of the National Flag with the black star in the centre was mistakenly turned upside down on some of the voter registration slips used for the ID Card. In an interview with the Ghana News Agency, a Director said the defect was detected at the last stage of the preparation on a fraction of the forms. He said the Commission accepted the forms in view of the time and financial constraints as well as to save any further delay of the electoral timetable. The EC Director asked political parties, eligible voters and other stakeholders in the electoral process to overlook the minor error. Some eligible voters GNA met at polling centres at Newtown, Nima, Mamobi, Kotobabi and Asylum Down among other places, challenged the Lamination Clerks about the validity of such forms. Meanwhile the Photo-taking exercises in the Greater Accra Region, which began on June 17 and would end on June 24, took off smoothly at all the centres the GNA visited. Unlike the usual Ghanaian practice of waiting till the last minute many people went in for their voters' identification cards on the first day. By the close of day the Standard Education Centre at Asylum Down, had issued 155 voters with their ID cards; Accra Technical Training Centre (A and B), 559 and Kotobabi Cluster of Schools Centre, 600. At the Ghana Private Road Transport Union polling station at Mamobi 240 eligible voters had participated in the photo-taking exercise at the close of day one, while the number at Nima Catholic Centre was 250.